I admire this woman for her resourcefulness, her courage, her driving will, her ambition, her loyalty, her intelligence, her piety… Above all, she was a complex, two-dimensional and multifaceted human being, a concept which so many people still seem to struggle with. 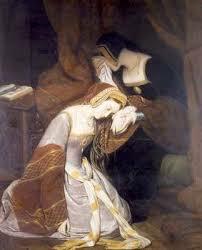 I have not found anyone in history who fascinates me as much as Anne Boleyn. I think she was an absolutely incredible woman who achieved things others could only dream about. She was cut down cruelly and unjustly in the prime of her youth, who knows how much longer she could have lived and how much more she could have achieved. I think her continuing legacy speaks volumes about her as a person, and I hope she has achieved the peace in death she was denied so cruelly in life, whether by the suspicion of her husband, the pressures of her position, or the slanders of court gossips and the nation at large. She has been so maligned and misrepresented even nearly five hundred years on. I admire Anne Boleyn and I congratulate her for everything she achieved in her inspiring life. RIP the Queen!